Style your home desk with the convenient LOF-309-O office chair from CorLiving featuring a fabric seat, contoured tilting mesh back support, gas lift and black legs with rolling wheels. The comfortable, contemporary design will accent any desk setting while offering the option to adjust to your desk height and body shape with ease. A great addition to any home! On the market for something different or to add a little colour to your home or office? This is the perfect chairfrom Ace Bayou with its uniquely designed seat that is extremely comfortable. This chair won't take up a lot of area if space is an issue. Chair can be used for a variety of reasons other than just at a desk! Set yourself up for success with this high-backed, ergonomic office chair. As fashionable as it is functional, this sleek chair features a convenient tilt mechanism and gas lift function to ensure proper alignment while you're working at your desk. Lean into the full back and headrest and place your arms on the curved armrests to enjoy comfortable support as you work. The sturdy pedestal base features five wide legs for stability, each with a rolling castor for ease of movement. The rich fabric cover is finished in a neutral black colour that easily complements any home office dicor with its clean and contemporary look. Work in ergonomic comfort while seated in this attractive office chair. Designed with both fashion and functionality in mind, this inviting chair features a convenient tilt mechanism and gas lift function to ensure proper alignment and positioning while you're at your desk. Lean into the cushioned high back and place your arms on the curved armrests to enjoy comfortable support as you work. The sturdy pedestal base features five legs for secure balance and rolling castors for ease of movement. Covered in a light grey fabric, this chair adds a pop of color to any home office while still remaining neutral enough to fit in with most interior dicor schemes. 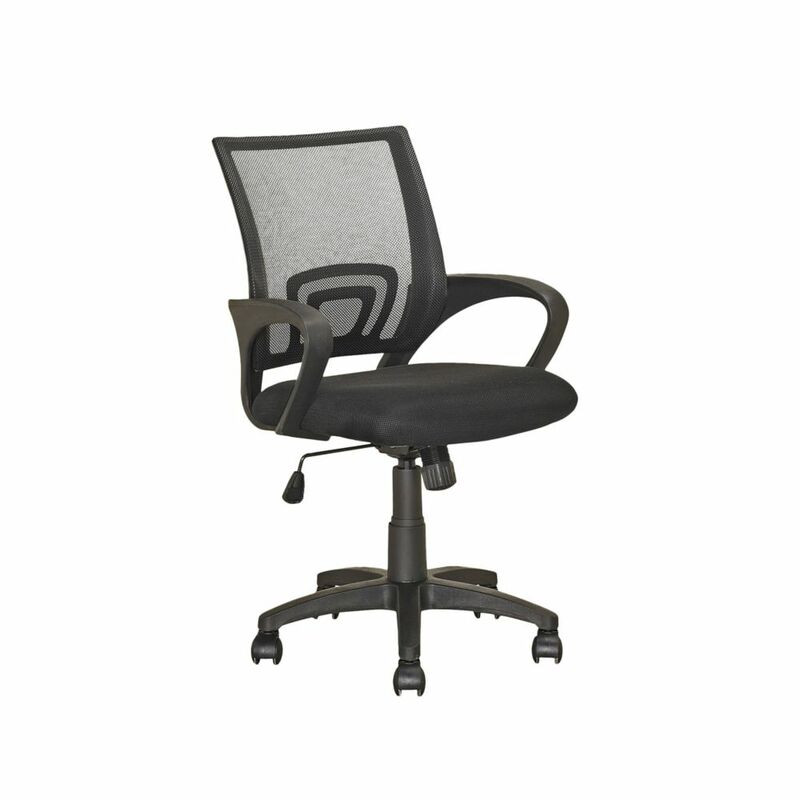 Experience the ultimate in workstation comfort with this multi-functional black office chair. The high back of this ergonomic chair features five position points that can be locked into place for custom comfort and a convenient rocking function allows this chair to move with you. Thanks to the built-in tilt mechanism and gas lift, proper alignment is easily achieved and the rolling castors on the five sturdy legs allow for easy mobility. The ultra-comfortable padding and rich fabric cover on the seat, back and headrest keep you cradled in comfort for extended periods whether you're working towards important deadlines or caught up in a challenging computer game. LOF-309-O Office Chair in Black Style your home desk with the convenient LOF-309-O office chair from CorLiving featuring a fabric seat, contoured tilting mesh back support, gas lift and black legs with rolling wheels. The comfortable, contemporary design will accent any desk setting while offering the option to adjust to your desk height and body shape with ease. A great addition to any home! LOF-309-O Office Chair in Black is rated 1.0 out of 5 by 1. Rated 1 out of 5 by Dino from Broke after a week, so did the second one The chair back broke after a week of use. After returning the chair, a second one also broke in the same place. Hello Mark, The weight capacity is 220 pounds.